Negotiation Evolved offers a comprehensive approach to negotiation and influence that can be applied in every situation, from large commercial deals to romantic partnerships and even hostage crises. Reading this book will equip the reader with the mindset, insights and tools to increase rapport, trust, value, understanding, agreement, commitment and satisfaction in every negotiation. And when do we negotiate? All the time, and in every single interaction we have! Much of the writing on negotiation asks "which style of negotiation is best? "; our central question as experienced negotiators and educators has evolved to "how can you become the best negotiator you can be?" 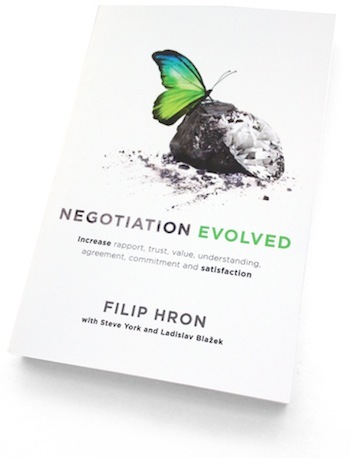 Negotiation Evolved was written by Filip Hron together with two former commanders of police negotiation units, Steve York (Australia) and Ladislav Blažek (Czech Republic). Go to www.negotiationevolved.com to buy the book. "...[I] was thrilled with the improvement in my communication skills and outcomes. I consider this book essential reading not only for anyone in business but all those who are interested in effective communication..."
"...I particularly like how the book is structured, where you gradually start seeing more and more of what goes on behind the scenes, and beneath the surface, in all kinds of negotiations (and everyday interactions!)..." "...If more people adopt the principles and approaches you show, the world will be a better place. This book is a Life and Career Companion..."
"...I have rarely come across a book that covers a topic in such a comprehensive and practical way. If you are looking for a book on negotiation that can be applied in everyday situations, get this one. It will significantly maximize your outcomes!" "It was an eye opener to for example read how in negotiation it is not as straight forward as having a ton of logical arguments; there are many other considerations that a negotiator has to make. I like how the book makes use of short, to the point, and relatable examples to explain theories and learnings. The humorous small tweaks here and there also made for an enjoyable read."